Born 11 August 1862, Glasgow, Scotland. 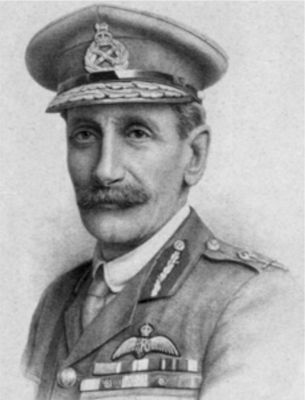 David Henderson was a Glasgow graduate who was a leader in the field of military intelligence, serving as Director of Military Intelligence under Lord Kitchener from 1900-1902. He learned to fly when he was 49 years old and was first commander of the Royal Flying Corps during World War I. He is often credited as being the "father of the Royal Air Force". The son of the Clyde shipbuilding family of Hendersons Henderson was born in Glasgow on 11 August 1862. He matriculated at the University of Glasgow in 1877, aged fifteen, to study engineering. He remained there until the session 1881-1882, when he left to attend Sandhurst. In 1883 he joined the Argyll and Sutherland Highlanders and began a distinguished military career. He also published two important manuals, Field Intelligence: Its Principles and Practice (1904) and Reconnaissance (1907). As the Great War ended he continued to serve in important public offices. He was a military counsellor in Paris in October 1918 and went to Geneva to organise the Red Cross Societies. He was created created Knight Commander of the Order of the Bath (KCB) in 1914 and Knight Commander of the Royal Victorian Order (KCVO) in 1919. He was honoured by the University of Glasgow with an LLD in 1920. He died on 17 August 1921 at Geneva.